Ah, me hearties! It's been a long time between blogs. Dreamagic is sulking in a pen at Royal Queensland Yacht Squadron and is currently being used as no more than an apartment. A luxury apartment grant you, with 360 degree water views, 4 bedrooms, 2 bathrooms, three showers, etc, but there is a huge rising damp problem...oh, that's the harbour. Other than as transport for a couple of boys weekends down at Canaipa Dreamagic has not been sailing for ages. My beautiful thoroughbred fast cruiser is reduced to straining at her mooring lines as she watches the other boats go out each Wednesday for Wags. One should not attribute human emotions to inanimate objects, (they hate it), but I know Dreamagic is not happy. However all that is about to change. 2013 is the year Dreamagic follows the sun back to Cairns. Probably a June departure, she will be at Hamilton Island on the 18th August to scoop old friends, or rather friends of long standing Nerida and Craig and we'll take the boat to Magnetic Island for Race Week which starts on the 29th. That seems a long way out, but the planning of these things take that long. The Race has to be entered, insurance, berths and hotels booked, flights arranged. Today Dreamagic has been visited by the rigger who will check the rig, tune it and hopefully sign it off. Next week the mechanic comes down to wave his magic spanners over the motor, and after the New Year the cabinet makers come aboard to fix the damage done on our Louisiades trip. Dreamagic loves being centre of attention, (she is such a media tart) and I swear has got 2 foot longer and 5 shades whiter since people have started making a fuss of her. And before all this, she is going to Southport YC for New Year. So, if anyone is around the Gold Coast over the coming holiday, come down and say hi. If anyone's plans will mean they are somewhere on the East Coast of Queensland next year, let us know and we'll try to rendevous. Meanwhile, it's great to be back! Grab a glass of red, a box of tissues and enjoy! I recently had an email from someone who follows Willi’s sporadic adventures and has now decided to buy a Beneteau Oceanis and sail her from Europe to New Caledonia. What! 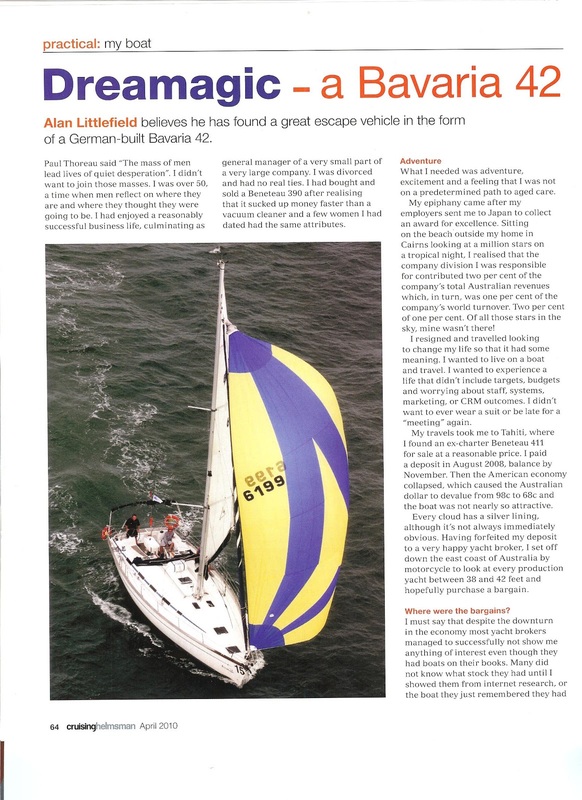 Whilst I would say that without sailing experience this would not be an undertaking for the faint hearted, I would say that following your dream becomes even more important as you get older. Let’s face it, when you are old, immobile and dribbling down the front of your shirt all you will have left is your memories. I think it is therefore probably important to have some! Good luck Greg, and write a blog! Greg sent the email because he hadn’t heard anything from Willi since November last year and thought he may have sunk, or been captured or some other fate worse than death. This is not so, but I thought I probably should finish the story. What now though? Since we have been back Dreamagic spends most of her time tied in her pen at RQYS. We sometimes race at WAGS in Brisbane and enjoy mid fleet results amongst some 50 similar boats. We take the boat out for occasional weekends on the bay, weather permitting and use her as our holiday cottage for weekend sleepovers at the club. Fun but a far cry from her days of glory when seeing her sails appear on the horizon set many a young (?) girls heart aflutter and other skippers resigned themselves to coming a poor second to the fun ship. So what is the next instalment? 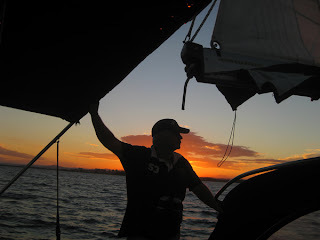 Well 2012 is earmarked as another year of adventure, but this time sailing the accountant seas. I have launched another website, which you can find http://www.inomad.com.au/ I want to get this up and running and so will be devoting all my time to that. (Wednesday afternoons excepted, naturally!) I would encourage you to visit the site, and if you enjoyed Willi’s adventures PLEASE join where I am assured his bro, Willi Crash will be writing soon. And if you know Willi personally or just enjoyed his rants, PLEASE click on every bloody “Tweet” or Facebook “Like” you can find on the site! Thanks for your company on the voyage. It has been an honour to have you aboard. You've Read the Book, Now See the Film!